April showers have already brought flowers. 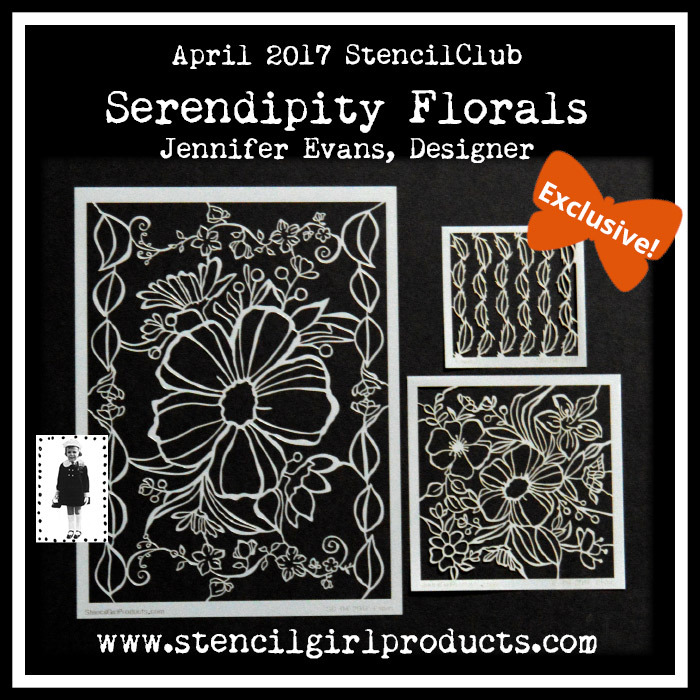 Our Voices, Jackie Davidson, Eva Gronroos, and (yours truly) Carol Baxter, let their imaginations blossom with Jennifer Evans' Serendipity Florals. See for yourself! You'll need a painted spindle or dowel. newspaper, glue, paint, pens, a bit of ribbon, a button, needle and thread, and of course stencils to recreate Jackie's scroll. 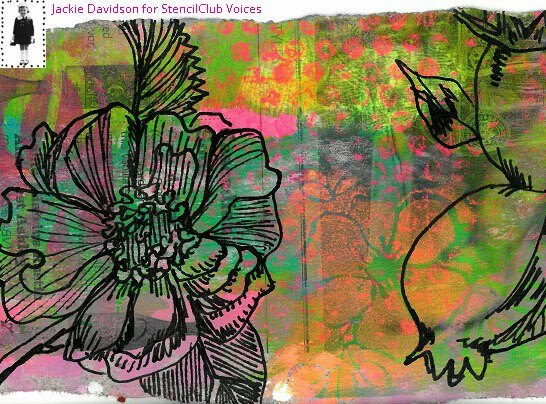 The gorgeous background is stenciled over newsprint and Jackie hand-drew the flowers. "When I was chosen to be a SG voice I was so excited and happy. Because of this opportunity I decided that I needed to challenge myself: To do something that I either had not done before, or perhaps try new art supplies." 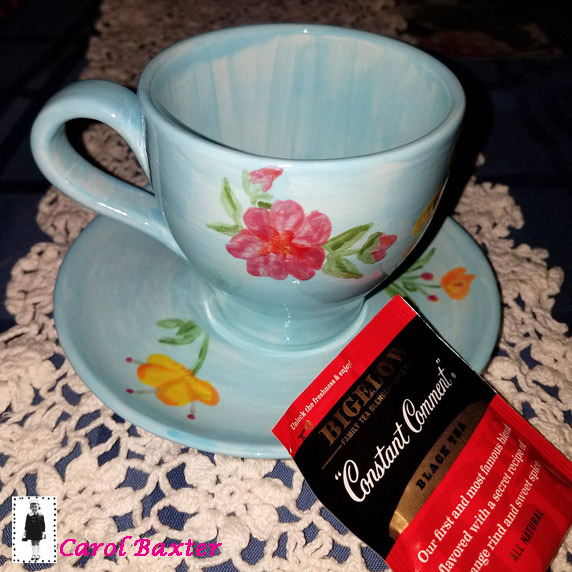 "Last month I stenciled on fabric for the first time and used my fabric paint set, also for the first time. I absolutely loved it and am going to continue to stencil on fabric. I would love a summer skirt with last month's pineapples along the border!" 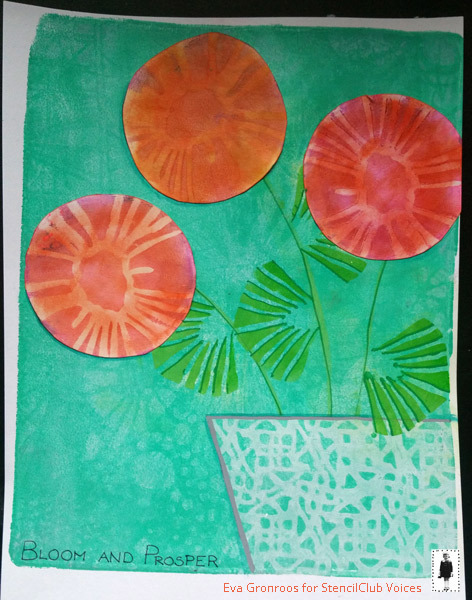 "This month I decided that I would do something that has been intimidating me for a long time: Gelli Printing. I know this may sound ridiculous to many of you, but I quite simply was having a problem with the whole "play-and-let-go" concept. This month I have spent two weeks of making prints every night, and I have learned so much! 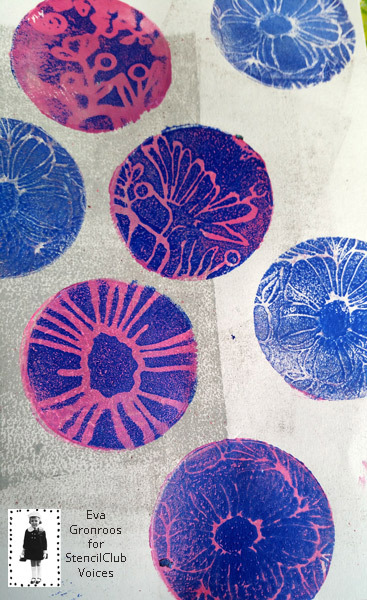 I understand why the gelli plate is so popular and I finally understand what people mean when they say that you should just "play": By just doing, repeatedly, you open yourself to new ideas and your creativity kicks in with new ideas that you can try. So, I can not compare my beginners-prints to some of the amazing things I have seen on the blog, but they were fun to do and I like them." 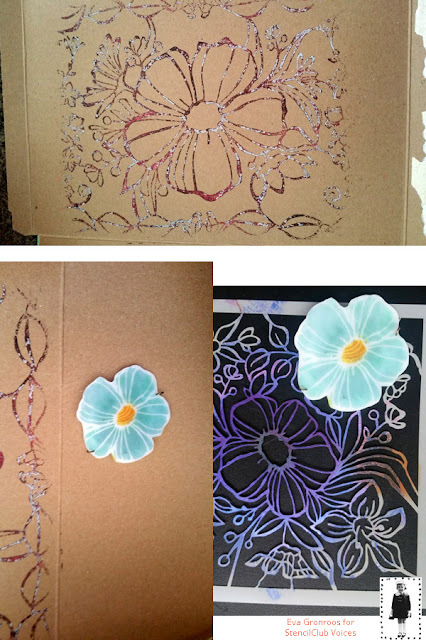 "Using a small round plate and the inner part of the big flower on the 9x12 stencil I made the flowers for my journal page. 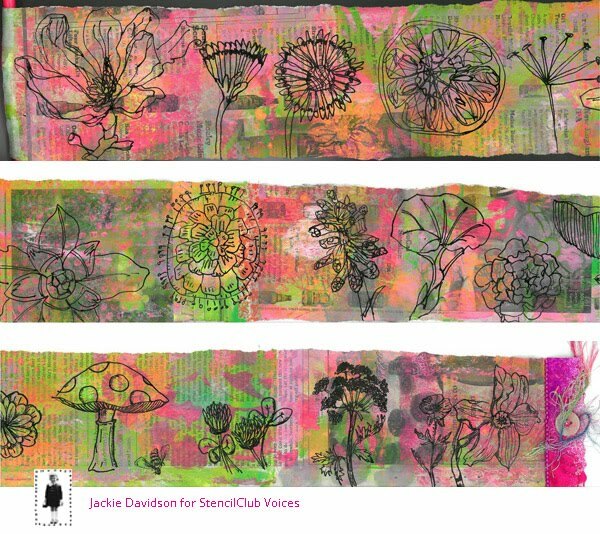 The background is repeated prints of the whole stencil and the January 2017 club stencil. The "vase" was made by masking off and painting an area white and then use a baby-wipe over the 6x6 club stencil from June 2016. After one of my prints using black paint, I used the stencil as a "stamp" on a previously printed background. I then colored in the flowers with prisma color pencils. The black marks gripped the color in a really interesting way, but I was not 100% happy and decided paint over the pencil with my paper artsy colors. I did not check and ended up using one of the translucent colous. This turned out amazing and was totally unexpected! It most probably does not show up well, but try it out!" "While doing all these prints the "what ifs" started to pop up. I have never stenciled on shrink plastic, so I used my archival inks and the 9x12 and made flowers. (Of note: When shrunk they end up the same size as the flower in the 6x6. This would make such a nice element on a card for those of you who are card makers!) 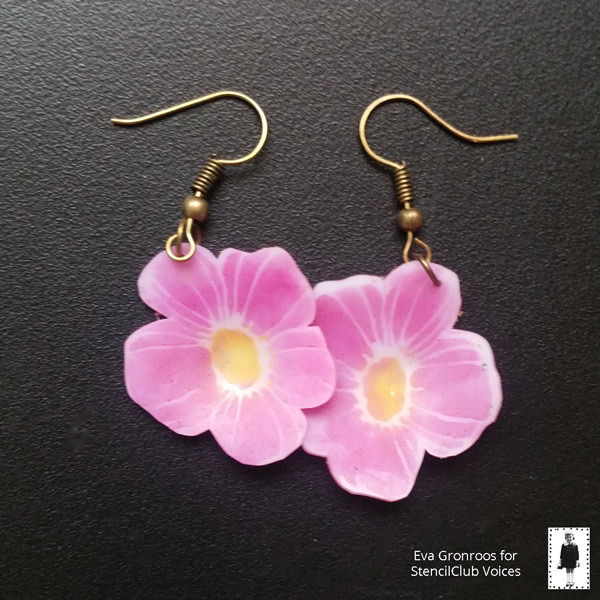 I wanted to make a bracelet and this will happen when the final parts arrive, but for now I can only share the earrings that I made from shrink plastic and the 6x6 stencil." "Thank you again StencilGirl for letting me try out the stencils and for giving me an opportunity to explore new things!" "I hope you enjoy my projects!" Greetings! Carol here again. What's your favorite tea? I like Lemon Ginger or Constant Comment to keep me fortified while I am blogging. The designer mentioned tea cups and I took it as a challenge. The project is stepped out on MY BLOG. I had a blast painting at the pottery painting studio, but next time I know to bring more precise paint brushes :) for detail work. Voices Jackie and Eva rocked their projects! StencilGirl has the best art community! 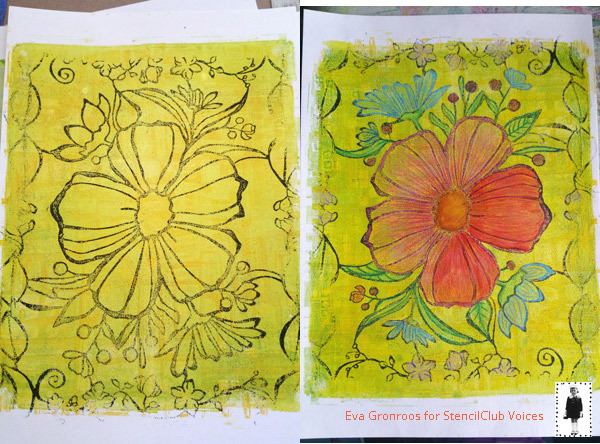 If you are a member of StencilClub, we'll be drawing for Voices again mid-May. Reach out to me via the Secret Group and I shall put your name in the hat! Hope your creative juices are flowing and you are ready to stencil your heart out! 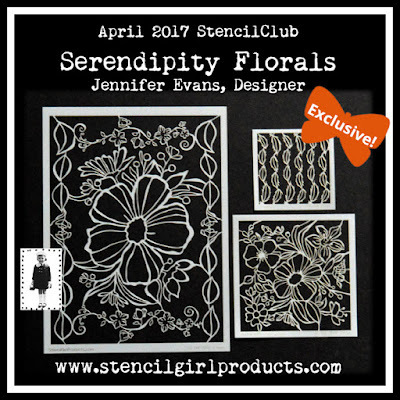 You can see Jennifer Evans' Reveal HERE, or SIGN-UP for StencilClub. what beautiful projects by everyone super creative !! !